We used to say everything America has, we will have in ten years. 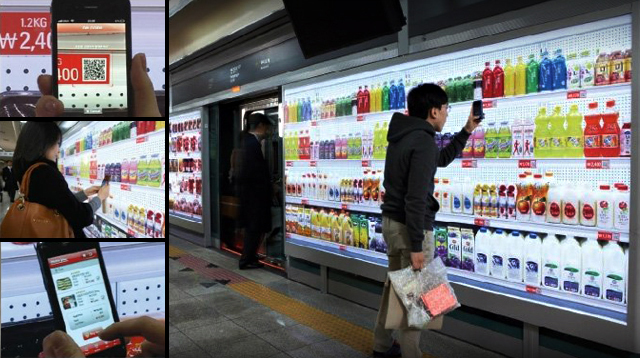 Now unluckily that will be a huge crisis... Could we just saywhat Koreans have we will have in a couple of years, for Korean commuters now have Tesco's virtual subway store. Going super market shopping is just another time consuming chore on Koreans daily routine. But what if things were made more fun by combining ambient marketing and mobile commerce? This is what Cheil Worldwide set out to do for Home Plus (what Tesco is known as in Korea). An image that resembled a super market fridge was put up on a subway wall, with QR codes where prices normally go. Simply scan the QR code and products get added to your online cart. The best part of all? Your order will be delivered by the time you get home.